It’s not a must-buy, but if you’re searching for a decent full metal CO2 airsoft revolver, the Black Ops 4” Chrome Exterminator Airsoft Revolver by Bear River can provide hours of enjoyable casual backyard shooting experience. Actually, calling it “full metal” is a little misleading. 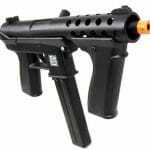 The grip is made of fairly durable black polymer plastic, and it can be opened to reveal the CO2 cartridge housing which is also created out of the same material. Apart from these two components, the rest of the revolver is all metal. We particularly like how easy it is to open the grip and install the CO2 cartridge on the Black Ops 4” Chrome Exterminator airsoft revolver. Once you’ve opened it, look for a dial at the bottom which you need to turn, then you insert the cartridge, screw it in, you put the grip back together—easy stuff. Although the CO2 is fuss-free to replace, reloading the BBs is quite the hassle. The annoying factor here is that the revolver comes with only 6 cartridges and after firing off all 6 shots, you need take out all the cartridges and reload a BB into each one. It sounds easy on paper, but in practice, it’s actually pretty tedious. You can’t just quickly pop in a BB into the cartridge and then load the whole thing into the revolver’s cylinder. The actual process involves carefully inserting the BB into a hole at the tip of the cartridge, and making sure it lets out a clicking sound. The clicking signifies that the BB is properly in place; otherwise, the revolver won’t fire. Next, you put in the cartridge into the cylinder and you also have to make sure that clicks too. Do the above for all 6 cartridges and you’re set. If that doesn’t sound tedious to you, then the Black Ops Exterminator is tailor-made for you! An extra cartridge would’ve been dandy, but you can purchase them separately of course. At the very least, the manufacturer should’ve thrown in a speed-loader. And then there’s the accuracy factor which is underwhelming to say the least. At 10 feet, the accuracy is divine. Not too shabby at 20 to 30 feet, but past that, it’s atrocious. So if you’re thinking of buying this to accurately plink targets more than 30 feet away in your backyard, don’t bother. Other than these two issues, this revolver is actually a solid buy. 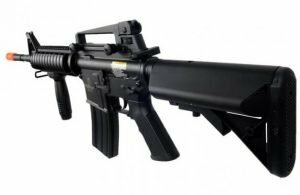 It has a wonderful blend of balance, feel, and weight, excellent durability (it’s mostly made of metal after all), good grip, and considerable FPS. 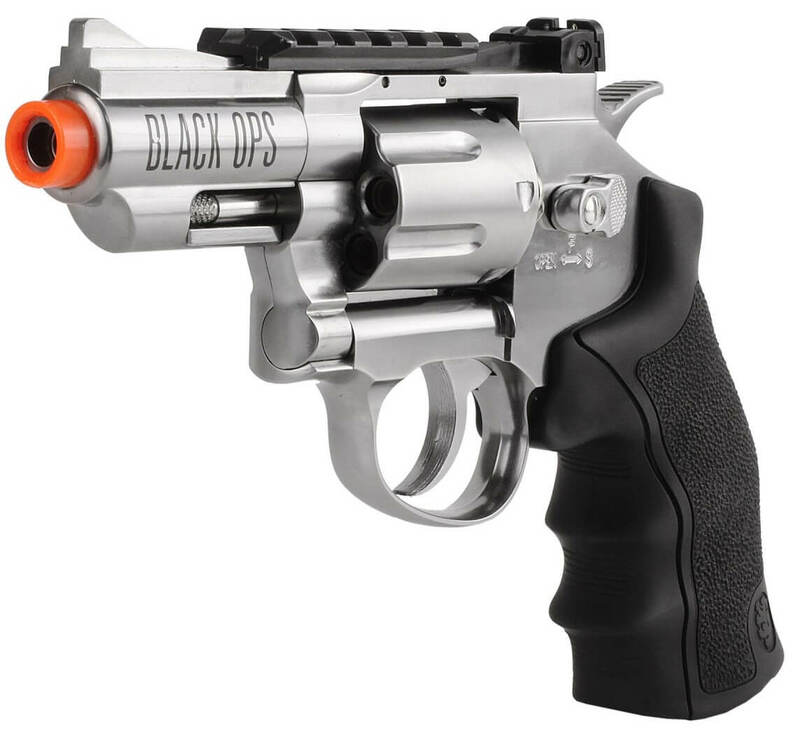 The Black Ops Exterminator captures the above ingredients flawlessly, and with its aesthetically eye pleasing design, the result is nothing short of one of the best close to full metal airsoft revolvers on the market. Pulling the trigger feels great with the right amount of smoothness in either single- or double-action. With single-action, the average FPS is approximately 415, while 390 is about the average FPS you’d get if it is fired in double-action. It’s hard not to like the Black Ops 4” Chrome Exterminator airsoft revolver. 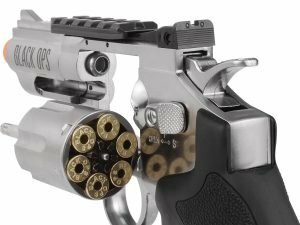 While the range and accuracy is mediocre when it comes to hitting targets that are more than 30 feet away, and the BBs reloading process can be tiresome, it is still a really good CO2-powered airsoft revolver. Plinking targets that are 10 to 20 feet away with this thing is truly jolly good fun. 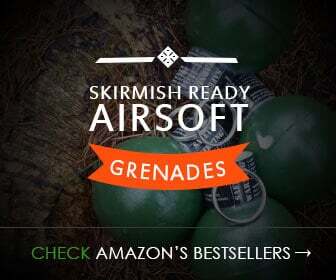 If, like us, you are not completely sold on this sidearm take a look at our airsoft revolver top list. Feels great in hand, though the short barrel lets accuracy down. The Black Ops 4” Chrome Exterminator Full Metal Airsoft Revolver is well built, looks realistic and feels good in hand (though does feature a plastic grip), changing CO2 canisters is a breeze - BBs not so much.